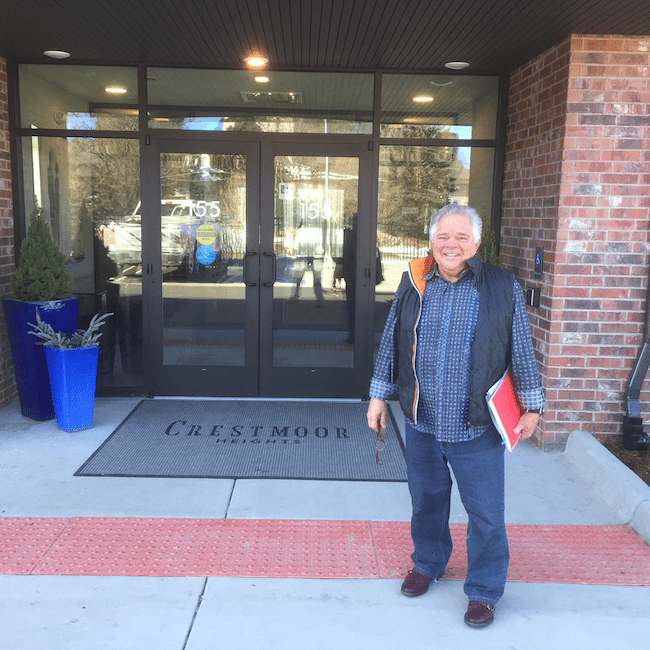 Peter Kudla stands in front of Crestmoor Heights. Peter Kudla is not just a veteran Denver developer. In addition to developing a wide range of projects, Kudla is a raconteur and bon vivant. “Some people know me more for my cooking than for my developments,” Kudla told Rebchook Real Estate Watch earlier this week. 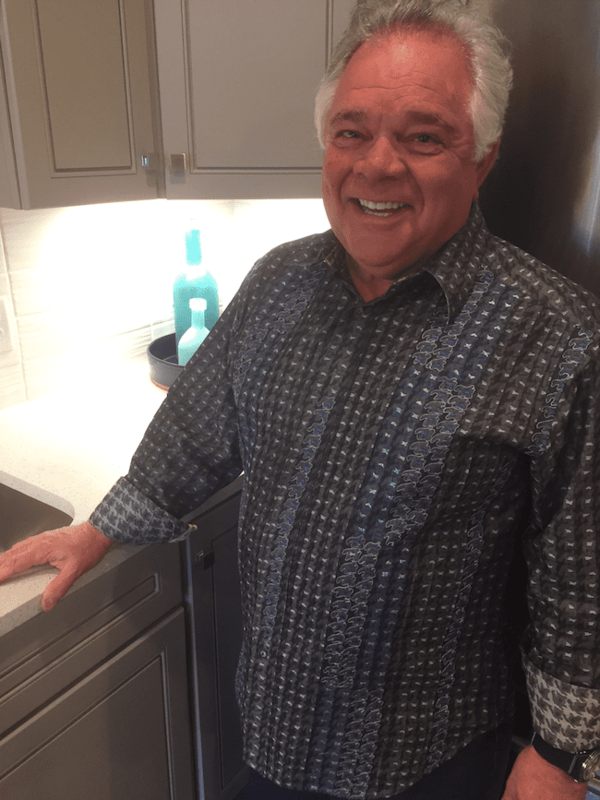 It’s also safe to say that Kudla, 65, the CEO and founder of Metropolitan Homes, is the only developer in Denver who in his spare time serves as an auctioneer for charity events. Last year, for example, Kudla auctioned a suit jacket owned by legendary Broncos linebacker Von Miller for $35,000. The proceeds from the “Be Beautiful Be Yourself” fashion show went to the Global Down Syndrome Foundation. On a real estate note, industry officials praised by Kudla for his victory in a construction defect lawsuit that went all the way to the Colorado Supreme Court. And, unwittingly, for about a two-year period, Kudla was the poster boy for antidevelopment rancor in Denver. “All of a sudden Peter Kudla was painted as the villain,” said Kudla, who has been involved in Denver real estate for more than four decades. Kudla cut his teeth by working for Denver-based MDC Holdings Inc. starting in 1978. At first, he built and managed apartments for MDC. Later, he sold and built homes for the company, which at the time was a small, local operation. Today, MDC, parent of Richmond American Homes, is one of the nation’s largest homebuilders. He had a lot to learn. Early in his career, he decided to show off his culinary skills by grilling salmon inside of a model home – filling the unit with fish smoke. From 2015-2017, Kudla was caught in the crosshairs of the antidevelopment outrage sweeping Denver. In Kudla’s case, the controversey swirled around one of his smaller developments – what ended up being a three-story, 66-unit condo and townhome community in Crestmoor Park. “Big uproar over a small Denver project,” a Denver Post headline thundered in 2015. The development, called Crestmoor Heights, is now completed. 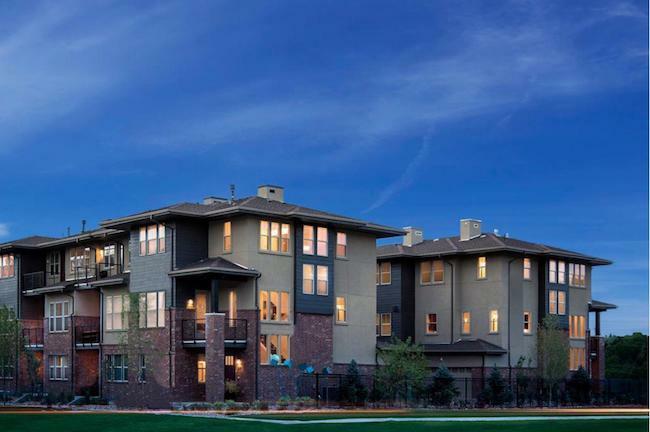 The 25 three-story townhomes flew off the shelves last year and are sold out. The 41 condominium units received their certificate of occupancies in December. Before tackling Crestmoor Heights, Kudla developed Vallagio at Inverness, with approximately 1,000 units on 62 acres. In 2017, Kudla won a construction defect lawsuit involving Vallagio. “We should all give Peter Kudla a standing ovation” for his Colorado Supreme Court victory, a real estate attorney told about 500 real estate leaders attending a Colorado Real Estate Journal conference soon after the court decision. Going forward, Kudla plans a 29-acre community in Stapleton. “It will be like taking the Vallagio concept but with more open space,” he said. The Stapleton development likely will have 700 to 800 homes when completed. It will include both rental and for-sale homes. Crestmoor Heights was Kudla’s first true, urban infill development. In the late 1980s, however, he did work with fellow developers Jeff Selby and Allen Gerstenberger to convert the former Neusteters department store building into rental apartments in downtown Denver. Kudla also has developed projects in Lowry, which is a stone’s throw east of Crestmoor Heights. In November 2013, “when we were working our way out of the recession,” some “prominent people” in the Crestmoor Park neighborhood asked him to look at redeveloping the dilapidated Mount Gilead Baptist church site at South Monaco Parkway and Cedar Street Denver. “Somebody had tried to redevelop it with no success,” Kudla said. The three-story Crestmoor Heights was designed by Jim Bershof of OZ Architecture. Kudla even attended several services at the “authentic black church” to get a feel for the site. “My first thought was it would be a great infill opportunity for an age-targeted demographic,” Kudla said. “It would have 120 unit and be all rental,” he added. Eventually, he had the 2.3-acre site rezoned for 75 units, but only built 66. Before he could put a shovel to the ground, however, he had to fight a lawsuit and neighborhood opposition. A grass-roots group, Friends of Crestmoor Park, was formed to oppose the development. Some neighbors wanted the site to be redeveloped as single-family homes. They feared congestion and parking problems from a more dense development. None of the neighbors’ fears have materialized, Kudla said. “There are no parking problems; there are no traffic problems. Nada,” Kudla said. In fact, he said most people in the neighborhood apparently now feel Crestmoor Heights is an asset for Crestmoor Park. “We have not received any negative comments” since it opened, said Deborah Green, Kudla’s longtime sales and marketing director. Indeed, a testament to the neighborhood acceptance is that more than 80 percent of the townhome buyers were moving from single-family homes in Crestmoor Park. “A lot of people who come here praise the architecture,” Green said. Crestmoor Heights was designed by Jim Bershof of OZ Architecture. 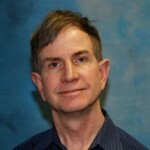 Bershof lives in the neighborhood, Kudla said, which was one of the reasons he hired him. Some observers have painted the fight against his development as entitled rich people not wanting more affordable, attached-housing in their neighborhood. “I think what it comes down to is that some people simply don’t want change,” he said. I asked Kudla what lessons he learned from the ordeal and what advice he would offer to fellow developers. “I would advise them that the process is going to take much longer than what they projected,” he answered. 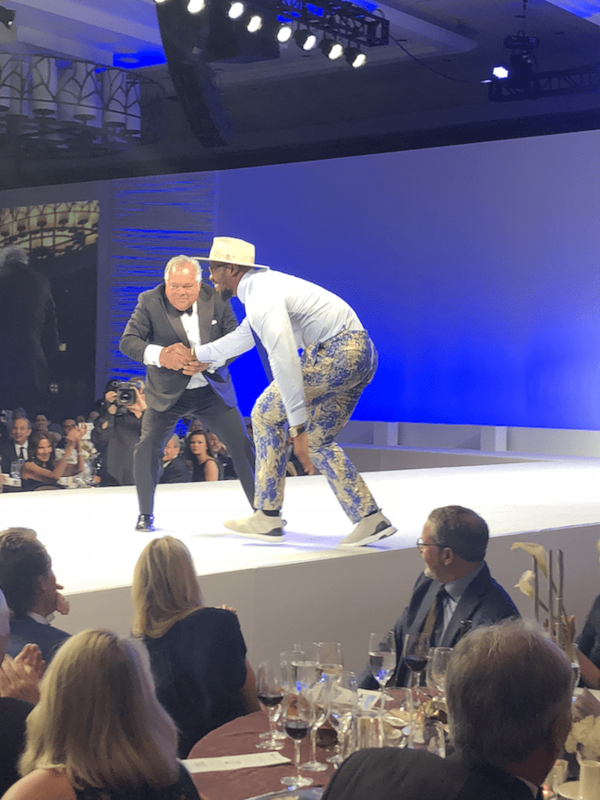 Peter Kudla, shown with Von Miller at the “Be Beautiful Be Yourself Fashion Show” fundraiser. Also, some people will draw a line in the sand. They will always oppose the development no matter how you deal with their objections or try to reach a “win-win,” compromise. “Some people won’t believe you, won’t believe the planning department, won’t believe elected officials,” Kudla said. All of that is extremely frustrating and tiring – even for someone as energetic as Kudla. “I wouldn’t buy another piece of property that needs to be rezoned,” Kudla said.